Directed by M. Muthaiah and with music composed by GV Prakash, the Karthi starrer Komban is all set to release on April 2nd. More titbits about this film have just come in. - It is reported that this film will open in about 350 screens across Tamil Nadu. - Further, the film will be certified by the censor board by this Monday. - The promotions are likely to start in full swing by this Sunday. 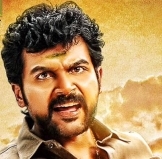 Post Karthi's raving success in Madras, Komban has set high expectations, particularly among the rural masses. We have to see how it fares alongside the likes of Nannbenda and Sagaptham, the other April 2nd releases. Trisha Illana Nayanthara, Starring GV Prakash, Anandhi And Manisha Yadav Is 50 Percent Complete. A Breezy Musical Treat From GV Prakash For Gautham This Summer ! After Ilayathalapathy Vijay, It's GV Prakash And Nakul ! People looking for online information on GV Prakash, Karthi, Komban will find this news story useful.